So as my husband john will tell you, being a creative person means I also possess a few hoarding tendencies. I see the potential in egg cartons, toilet paper rolls and things like old keyboards. I save stuff because I see the potential! 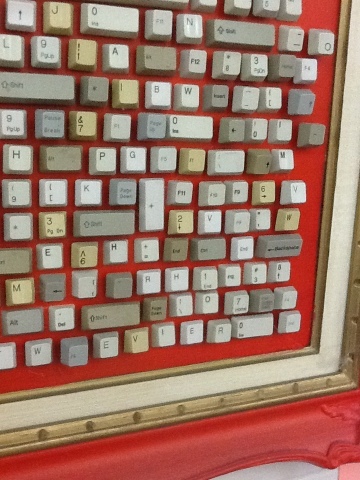 So, instead of throwing out old keyboards, I thought they could be used for something….then I came up with an idea for the computer lab at school… Why not make some artwork out of them? So, I used a butter knife to pop off all of the keys on the keyboard, found an old, ugly frame, painted it and then got out my glue gun…but then I realized that I needed more keyboards! So I put an ad on Freecycle. For those people who do not know Freecycle, it is great! It is a website where you can post looking for things, or offering things. It’s a great alternative to throwing things out, because there are always people like me who save stuff! 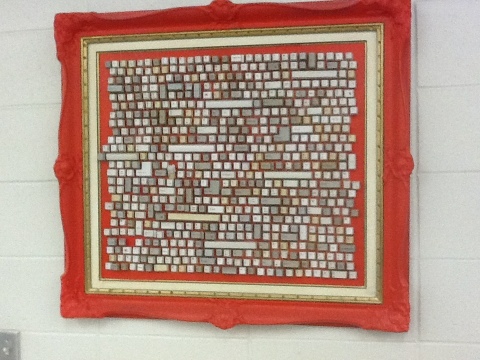 That piece took eight keyboards to make! The cool thing is you can also make smaller versions, and you can make personalized frames…why not spell out someone’s name or a message? So cute! One of my favourite websites, Instructables had a contest to see what you can make with coffee. The entries included everything from coffee marshmallows to coffee jewellery. 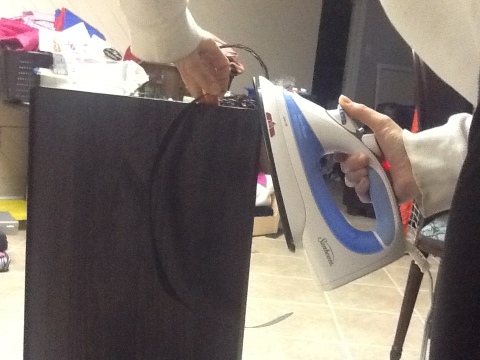 I didn’t get this project done in time to enter, but the contest gave me the idea… If you have a few, or several hours to fill in sometime, check out the instructables website. It truly has some of the most unique ideas I have seen. Very crafty, and inspiring! 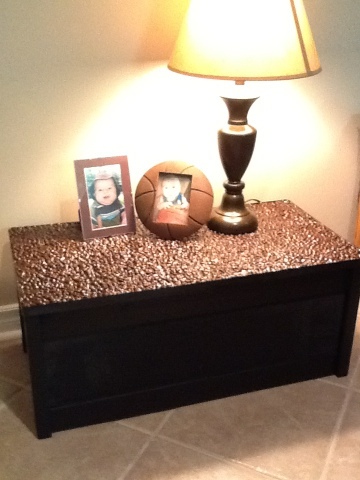 I started with an old toy box, envirotex epoxy, black stain a couple old bowls and lots of coffee. 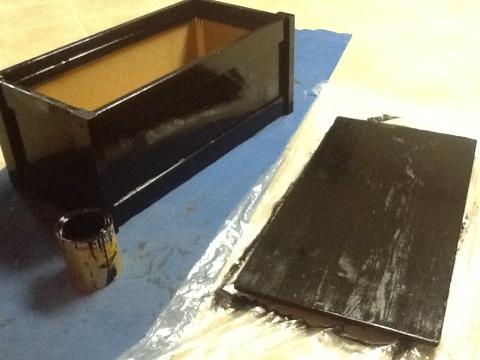 I began by staining the entire box. Btw, I love this stain because it has stain and varnish in one. 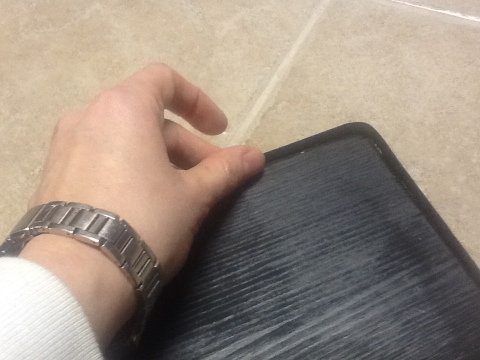 If you do two coats, the finish is shiny and sealed. I stained my entire dining room set using this stain, and I love it! 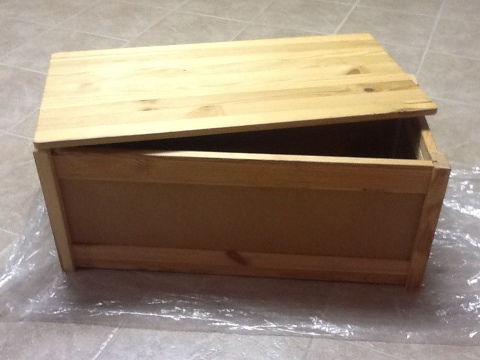 I gave the stain 24 hours to dry then added an iron on trim around the perimeter of the lid. This is a laminate trim that they sell at most building stores in the shelving section. I think it is normally used to cover up the particle board edges when making shelving. I have used it for a few things, but in this case it was perfect because it is a little wider than my table top so there is a little lip which will be enough to hold the coffee, and stop the epoxy from running off the edge of the table. 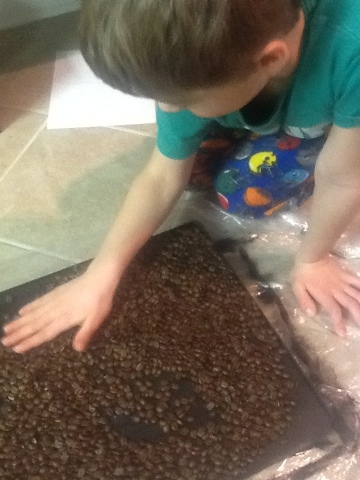 The kids helped spread out the coffee beans to make sure we had the right amount to cover the entire top. 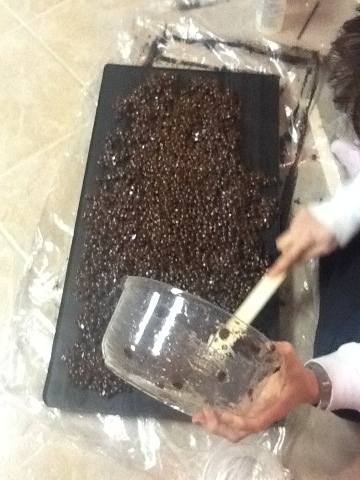 It took a bag and a half of coffee beans. 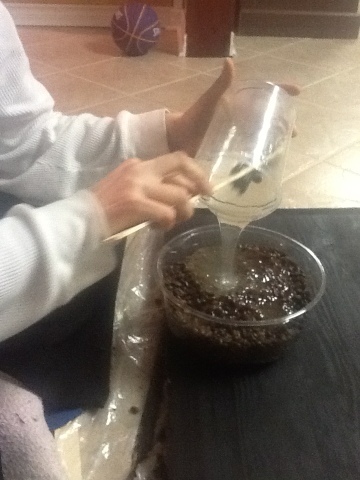 The I poured the coffee beans into a separate bowl. Fyi – be sure to use a disposable bowl, because this stuff can not be washed out with water, and probably unsafe too. You mix two equal parts of the epoxy together. The box recommends that you transfer containers before pouring onto your project. The reason for this is that if there are any parts like on the sides or bottom of the container that have not been mixed properly, when you pour them directly onto your project, they will not set. So, mix well for two minutes, then pour into another container, mix, then pour onto your project. In this case, I didn’t want to take the time to glue the coffee down first, so I just poured the mixture right into a bowl with the coffee beans. 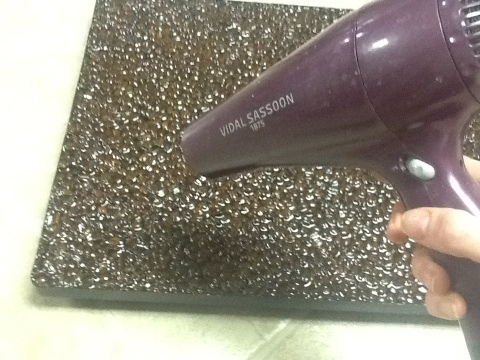 Then I poured the coffee out onto the table top. 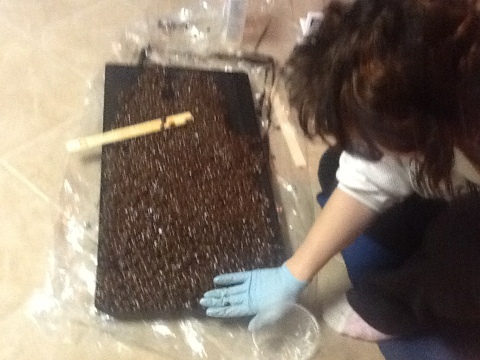 It was pretty sticky, which made it difficult to spread, so I tried using a paint stir stick, and gloves. 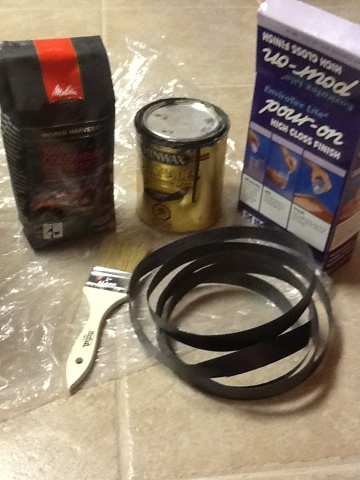 In retrospect, if I was doing this project again, I might glue down the coffee first… Next time! I did find that the easiest way to spread was to hold the stir stick lengthwise and sort of rake it across until I thought it was even. I did end up mixing a little bit extra to pour on top to add a little more around the edges. 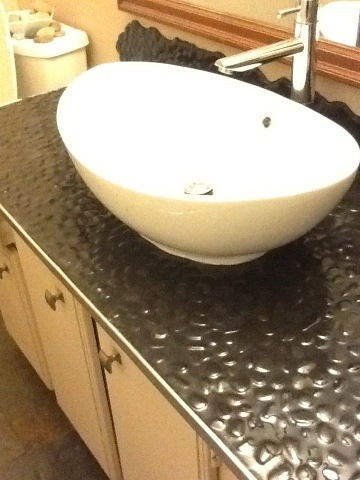 Here is a little trick I wish I had tried when I did our bathroom counter with this stuff. When you are finished pouring, if you notice a lot of little bubbles, use a hair dryer to gently coax the bubbles to the surface. As soon as the warm air hits the surface, you will see all the little bubbles popping. 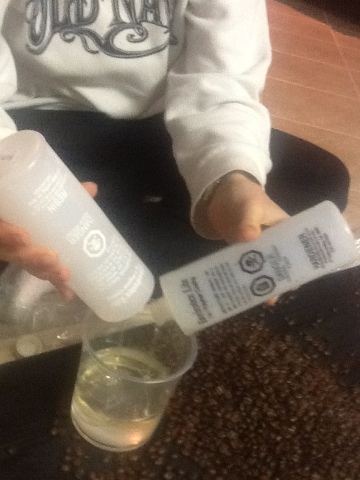 Most of the bubbles will not pop on their own as this dries, so this step is important. 729,811 Views! Tell your friends!